Contact lenses are generally used for correcting vision-related problems. Many people do not like to wear glasses due to the inconvenience it poses. Also, some people seem to believe that their face contour is altered due to spectacles and so avoid them. All such problems can be avoided by using contact lenses. It is important to note that not all lenses are the same and different kinds are available based on the eye problem to be rectified. Hence, the lenses can be used only on ophthalmologists’ recommendation and prescription. For instance, the specialty contact lenses for patients suffering from astigmatism, keratoconus, corneal scarring, and presbyopia differ from normal myopia. There are also special contact lenses for problems like dry eye syndrome or hyperopia. Rigid Lenses – These are also known as gas permeable lenses or, in short, GP lens. This type of lens is made from some rigid kind of plastic, which is durable. This lens allows more oxygen to pass through and reach the eye cornea. Thus, the cornea does not suffer dryness even after prolonged use. Moreover, no protein deposits on this lens, and so the risk of eye infection is minimum. As these lenses enable clearer and sharper vision, it is recommended for patients suffering from astigmatism. Soft Lenses – These lenses are made of silicone hydrogel and other soft materials. As the name suggests, they are soft to touch and wear. Also, the soft materials used in making this type of lens allow room for more oxygen for refreshing the eyes. Hence, it is preferred for patients suffering from keratoconus since other types of lens cause inconvenience such as irritation, dryness, etc. Hybrid Lenses – Hybrid lenses are made by combining the rigid and soft lens materials. GP lens plastic forms the central part of it. However, the soft silicone hydrogel makes up the entire peripheral part of this lens. Thus, the user enjoys the crisp vision provided by the GP lens with the comfort of wearing soft lens at the same time. These specialty contact lenses are mainly prescribed to patients who have normal and defective corneas. Nowadays, multifocal hybrid lenses are also available. Scleral Lenses – Scleral lenses are larger than other varieties of specialty contact lenses. This type of lens covers the entire cornea and its peripheries and further extends to the sclera or white part of the eyes. A gap remains between the cornea and the contact lens, filled up by the tears that keep the eyes hydrated. Hence, patients with corneal defects are recommended to wear this lens. Toric Lenses – Toric lenses are designed to cure the blurry visions caused due to astigmatism. When the cornea develops dual curves instead of a normal single curve, this lens rectifies the problem by aligning the line of sight. Ortho-k Lenses – Ortho-k (short for Orthokeratology) lenses are different from normal contact lenses. Its main function is to rectify the refractive errors of the natural eye lenses, like myopia, due to its property to temporarily reshape the cornea. They are used as an alternative to normal contact lenses by patients not comfortable with the latter due to irritation. Aphakic lenses – This type of lens is used by cataract patients who have undergone a surgery but are not provided with an intraocular lens. The aphakic lenses alleviate visionary problems in the absence of the implanted lens. 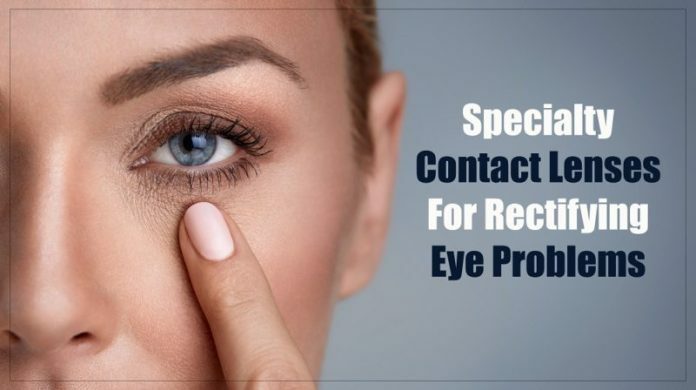 It is best to wear the specialty contact lenses only after the consultation of the medical eye specialists as they are aware of the needs of your eye and what is ideal for them. Visit an ophthalmologist, get your eyes tested, and wear a lens perfect for you.